Oh, how I miss you. Sort of. Mr. Glib and I are nearing the end of a large-scale construction project. On our end, one of our responsibilities was unloading a pre-fab storage shed and sifting through everything before re-loading everything into a permanent storage structure. It was fun re-discovering high-school yearbooks, old photographs, and that Bundt pan I never could locate. Also re-opened? 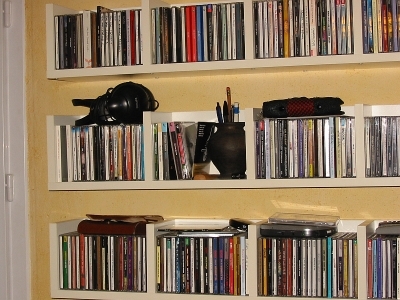 The proverbial Pandora’s box containing the ghosts of music past: 2-1/2 cardboard boxes full of compact discs. (Oddly enough, Aerosmith’s Pandora’s Box isn’t among my discs).